Free Sound Recorder for Windows XP - a small program designed to work with sounds. Using its functions, users can intercept audio frequencies from any source and record them on a hard disk or removable media. The application supports streaming songs from the Internet. A special system of profiles allows you to set personal settings for the utility for each PC owner. Thanks to the pre-listening tool, users have the opportunity to evaluate the quality of recorded sounds or songs. 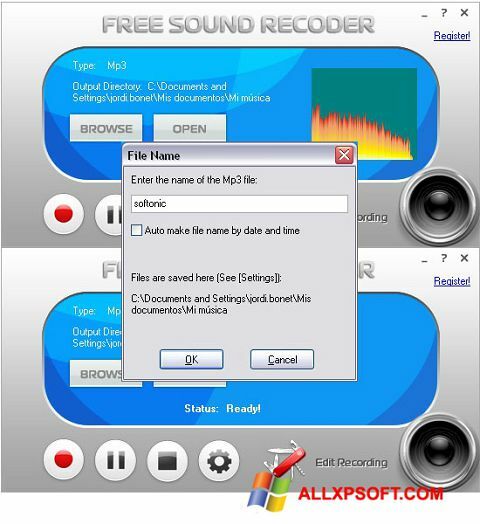 You can free download Free Sound Recorder official latest version for Windows XP in English.